Today’s bitter rematch between former world super welterweight champion Liam “Beefy” Smith (25-1, 14 KOs) and Liam Williams (16-1-1, 11 KOs) will air exclusively in Canada, starting at 2:45 p.m. ET / 11:45 a.m. PT, live from Metro Radio Arena in New Castle, United Kingdom. The replay of Smith vs. Williams I from this past April will also air on Super Channel today starting at 1:30 p.m. ET / 10:30 a.m. PT). 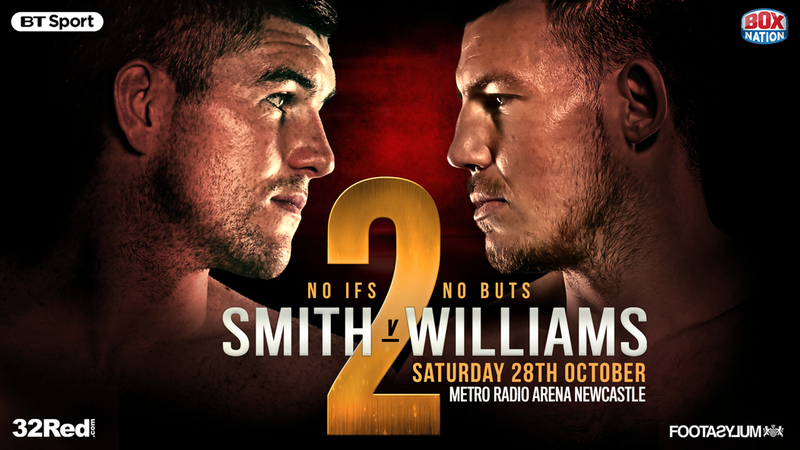 The Smith vs. Williams 2 card, presented by Frank Warren’s Queensbury Promotions, is headlined by the “Battle of the Liams,” Smith and Williams, squaring off in a 12-round World Boxing Organization (WBO) super welterweight title eliminator. Last April, Smith (25-1-1, 14 KOs) won a controversial fight in which Williams retired after nine rounds due to a double laceration of his right eyebrow, despite him leading on all three judges’ scorecards by identical scores of 86-85. Williams insists Smith flagrantly headbutted him, while Smith feels he was denied a knockout victory.